Today, I’m participating in the Grandmother Power Blogging Campaign, run by Tara Sophia Mohr. All kinds of bloggers are posting inspirational stories about grandmothers and elders — check it out! I was a college freshman at a giant state university, living on the ninth floor of a 10-story, high-rise dorm at the far corner of the campus. My only friend was from my high school. She was one of those women who are instantly likeable to men. As she sparkled and goofed her way through every gathering, she was an instant hit. I was the dumpy, plain friend in tow, and I knew it. While this may seem to be a run-of-the-mill thing for a grandmother to say, I had not grown up with this kind of thinking, this kind of “you are mine and you are fabulous” thinking — not even from her. I’m not sure anyone had every said anything like that to me ever. In other situations, I understand this clannish approval could take someone down less healthy paths, like denial or elitism. But for me at that point, having already struggled with illness, depression and coming-of-age traumas, her remark stood out clear and strong above my family’s murky emotional messages. This was a clear waterfall of love from her to me, a re-admittance, to the human race. I qualified. I mattered. And mattering to her meant it was time I should assume I mattered in the world. That’s what grandmothers, all elders, have the power to do. Their position and perspective places them best to pour unconditional love, approval and understanding to children. And none of us get very far without those things. I have learned, to my sorrow, that this straightforward giving of love is not so easy for mothers. Moms wear too many hats. We are the one who set boundaries, which by their very nature, don’t feel good. I veto playdates, make the girls clean up, let them know that skimming along on homework just isn’t good enough. I also get tired, say the wrong thing, laugh at the wrong moment. In moments of weakness, I get selfish about my time, I let my insecurities about their futures show. My love, my intent, gets lost in the myriad daily interactions of family. As I sadly watch my own tangled messages to my girls, I envy a grandmother’s straight path to her grandchild’s heart. I can only hope my deep love will emerge to my children later from a distance, like an impressionist painting coming into focus. 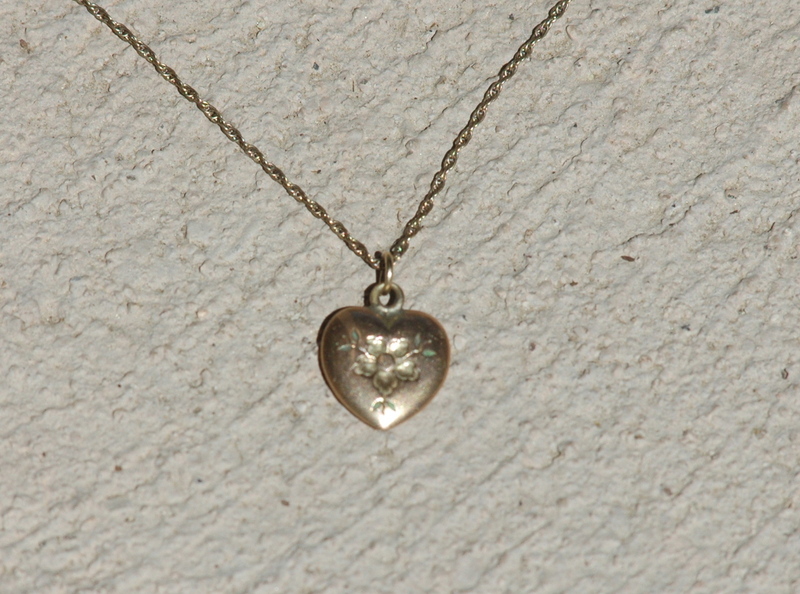 I have a golden heart pendant that I got from Gran. It could not be a more clichéd message between the generations, and it could not be more beautiful. A little pendant with a flower engraved in it, it has tooth marks on the back, from when she chewed it as a baby. This is my gift from my grandmother that I hope, as tangibly as possible, to pass on to my girls. And if I’m very, very lucky, to my grandchildren. This entry was posted in Family life, Parenting and tagged grandmother's love, grandmothers. Bookmark the permalink. I only met my grandmother once before she died because she lived in another country. She had 8 children of her own and about a million grandkids, yet she managed to make me feel special. She called me her international granddaughter, the one and only. That’s what grandmothers do, figure out ways to make their grandkids feels special even if they themselves don’t see what makes them uniquely awesome. I LOVE finding out more about your family! And it is so wonderful that she found a way to make you feel noticed and appreciated. That’s the wonderful realization I got from working on this post – the quiet power women have, especially ones who have lived for a while and seen plenty of things, to focus on what is important and make sure children get what they need.